Bolt Action – British InfantryBritain and her Commonwealth put huge numbers of men into uniform in WW2 to stem the aggression from Germany, Italy and Japan. Her small professional army was swallowed up defending a worldwide Empire and soon her forces were shattered and in full retreat, culminating in crushing reverses at Dunkirk and in Singapore.However, Britain stoically declined to surrender and, with her loyal Empire at her side, fought back. Re-equipped and refreshed they took the war to the Axis powers.The ‘Tommies’, as they were known, learned new techniques on the field of battle and by war’s end were highly trained and well-equipped.Warlord’s British infantry are tooled up for the job in hand. They are multi-part and can be assembled in a wide variety of ways, with a huge array of exotic looking weaponry. 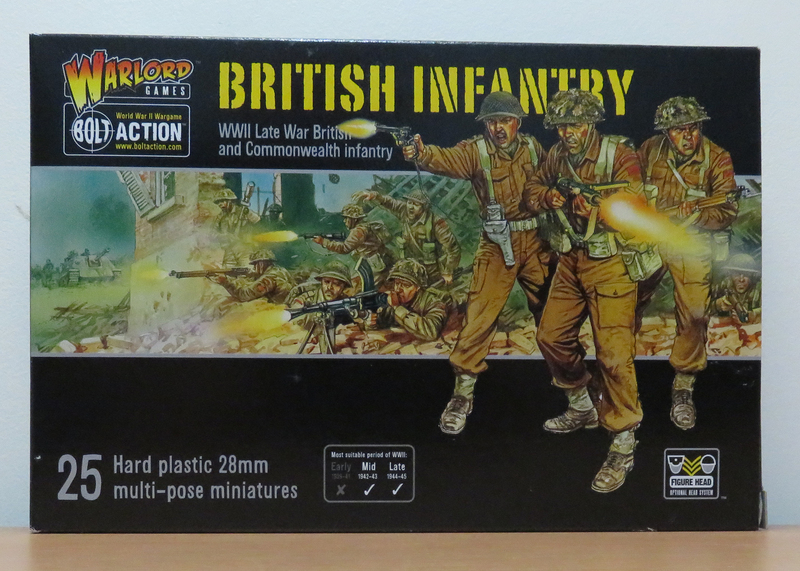 Fix bayonets!British Infantry contains: Enough plastic components to make 25 British infantry miniatures. Includes a host of options to allow for different weapon configurations and command models. Weapons included: Lee Enfield rifle No. 4 (plus scoped and bayoneted versions), Bren light machine gun, Thompson sub-machine gun, 2″ mortar, Sten gun sub-machine guns, Webley revolver, Mills bomb grenades, bandoliers and the Tommies’ trusty shovel! Round plastic bases (25mm diameter). Construction leaflet.